Add an artisanal touch to your favorite pizza recipes with Crave Brothers Farmstead Classics Cheese. October is National Pizza Month, celebrating one of America’s favorite comfort and party foods. Consider making your own specialty pizzas with fresh, luxurious ingredients including Crave Brothers Fresh Mozzarella, Mascarpone and Farmer’s Rope String Cheese. Pizzas are perfect for causal entertaining including football parties. 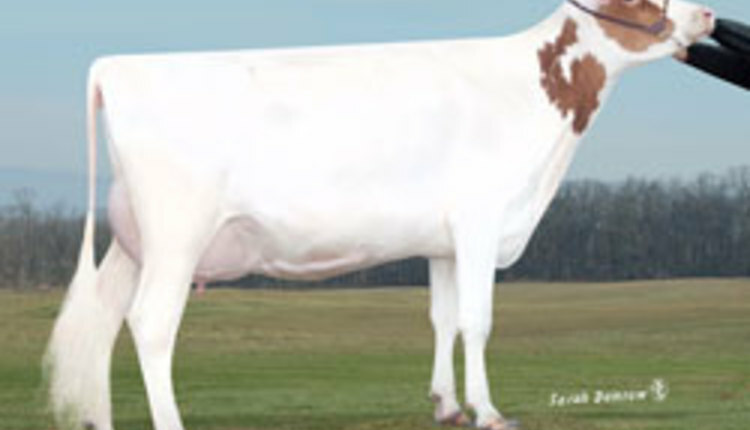 Crave Brothers Farmstead Classics are made with milk from the Crave family’s own dairy herd. Their cheese-making facility uses 100 percent green power, and practices water conservation and recycling. Here are three pizza ideas to elevate your pizza offerings at home. 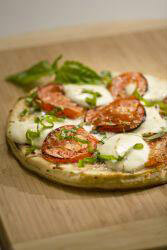 • Enjoy the simplicity of fresh flavors in the Crave Brothers Farmstead Classics Pizza Margherita. Start with a pre-baked pizza crust brushed with olive oil and topped with fresh ripe plum tomatoes and 12 oz. of Crave Brothers Farmstead Classics Fresh Mozzarella medallions or perlines. Sprinkle the top with 6-8 chopped fresh basil leaves and bake at 425° for about 10 minutes until the Fresh Mozzarella is bubbly. 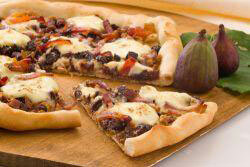 • Rich flavors and textures distinguish the Mascarpone, Fig, Sweet Onion and Candied Bacon Pizza. Using homemade or store-bought pizza dough, make the pizza with thick-sliced bacon, brown sugar, cayenne pepper, red wine, figs, fresh basil, butter, sweet onions and Crave Brothers Mascarpone Cheese. Before baking, spoon sautéed onions onto pizza crust, then drizzle the fig/basil/wine mixture that has been reduced to a syrup consistency evenly over the pizza. Top with dollops of mascarpone cheese bake at 400° for 15 minutes. Sprinkle candied bacon on pizza and bake for an additional 3 minutes. • It’s all about the cheese when you cut into the robust Stuffed Crust Pizza with Crave Brothers Farmer’s Rope String Cheese baked into the crust, and Crave Brothers Fresh Mozzarella slices on top. Farmer’s Rope String Cheese is a fresh, handmade deli string cheese shaped like a rope. 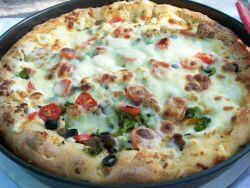 To make the stuffed pizza crust, add a 17” diameter unbaked pizza crust to a pizza pan brushed with olive oil. Unroll the Farmer’s Rope String Cheese and lay it in place against the edge of the pizza pan, breaking off any excess length. Bring the dough that is up the side of the pizza pan down over the cheese rope. Seal it tightly to the crust on the bottom of the pan as close to side of pan as possible. Brush or gently rub the crust with extra virgin olive oil. Continue preparing pizza with your favorite sauce, cheeses, meats and vegetable toppings, or follow the recipe on the Crave Brothers Cheese website. The award-winning Crave Brothers Farmstead Classics have been nationally and internationally recognized for their excellence. Three times this year, Crave Brothers Fresh Mozzarella has taken both First and Second Place honors in its category at major cheese competitions. In August, it won both First and Second Place Awards in its category in the 2017 World Dairy Expo Championship Dairy Product Contest. In July, Crave Brothers Fresh Mozzarella received First Place and Second Place Awards at the 2017 American Cheese Society Competition. And, at the U.S. Cheese Championships in March, Crave Brothers Farmstead Classics swept the Fresh Mozzarella category, placing First, Second and Third. Crave Brothers Farmer’s Rope String Cheese also won Second Place in the 2017 World Dairy Expo Championship Dairy Product Contest. Luxurious Crave Brothers Mascarponeis made from fresh sweet cream. It’s recognized by its velvety texture and rich flavor. The cheese has won more than 27 awards since its introduction, most recently earning a First Place Award in the 2017 Wisconsin State Fair Cheese and Butter Contestin the Soft Spreadable Cheese Category. For detailed pizza recipes featuring Crave Brothers Farmstead Classics Cheese, visit the Crave Brothers Farmstead Cheese website at www.cravecheese.com. 1. Pour water into a small bowl. Add the sugar, and sprinkle in the yeast. Stir the mixture until the yeast is dissolved. Let yeast stand until foamy, about 10 minutes. In a food processor, combine 2 3/4 cups flour and salt, and pulse 3 to 4 times. Add the yeast mixture and the olive oil. Pulse until the dough comes together, adding more flour as needed until dough is smooth, not tacky, when squeezed. Transfer to clean surface: knead four or five turns into a ball. 2. Place dough in a lightly oiled bowl, smooth-side up. Cover tightly with plastic wrap. Let dough rise in a warm place until doubled in size, about 40 min. Place Pizza stone in cold oven, and heat to 450 degrees F. Use 1/4 cup of cornmeal to dust a flat cookie sheet pan. With slightly oiled hands, press, toss or roll out dough to desired size and shape. Place dough on flat sheet pan dusted with cornmeal. Place Crave Brothers Farmer's Rope about 1 inch from edge of dough all the way around the pizza. Pull edge of dough over the Mozzarella rope, press to seal. Cover with a towel and let rise for 20 minutes. 1/2 cup sliced Kalamata olives, or black olives. Add toppings to dough that has been rising for 20 min. Start with pepperoni, green bell pepper, scallions, tomato, olives, shredded cheese and finish with Crave Brothers Marinated Fresh Mozzarella. Carefully slide pizza from flat sheet pan on to hot pizza stone already in oven. Bake for 15 minutes. Brush stuffed crust with the reserved marinade, drizzle leftover marinade over pizza. 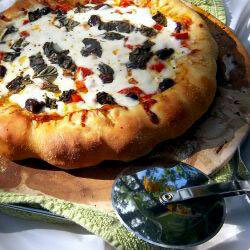 Bake additional 5 minutes, top with chopped basil, and serve right on the pizza stone. This is a flavor marriage that was made in heaven! Caramelized onions combine with red wine and figs. Topped with the rich and creamy mascarpone cheese is a wonderful melding of flavors. Adding a sprinkling of candied bacon makes this appetizer always the first to disappear. Preheat oven to 400 degrees. Spray a pizza pan with a non stick cooking spray, set aside. Line a baking sheet with aluminum foil. Spray an oven-safe cooling rack with a non stick cooking spray. Place rack on baking sheet. In a small shallow bowl, combine brown sugar and cayenne pepper; dredge bacon in mixture. Place bacon on rack; bake for 15 to 18 minutes until crisp and caramelized. Remove from oven; allow to cool, crumble and set aside. In a medium saucepan, combine figs, wine and basil; bring to a boil. Reduce heat and simmer for approximately 18 minutes until wine becomes of a syrup consistency. Meanwhile, heat a large skillet; add butter and onions. Cook over low to medium heat and stir occasionally, until onions are tender and caramelized; approximately 12 minutes. Place pizza dough onto the prepared pizza pan; brush the edges of the dough with olive oil. Spoon sautéed onions onto crust. Then spoon fig and wine mixture evenly over all. Top with dollops of mascarpone cheese. Place in oven, on center rack and bake for 15 minutes. Sprinkle candied bacon on pizza; bake for an additional 3 minutes. Slice and serve. Preheat oven to 425° F. Place pizza crust on pizza pan. Brush pizza crust with olive oil. Arrange tomatoes and fresh mozzarella on pizza. Sprinkle chopped basil over entire pizza. Bake about 10 minutes, or until cheese is bubbly. Serve immediately. Preheat oven to 425°F. Prepare a 14-inch deep dish pizza pan by oiling it with extra virgin olive oil and dusting it with cornmeal. Roll out dough for the crust so it has a 17-inch diameter. Place the cough in the pizza pan, centered. Unroll the Farmer’s Rope and lay it in place against the edge of the pizza pan, break of any excess length. Bring the dough that is up the side of the pizza pan over the cheese rope and seal tightly to the crust on the bottom of the pan as close to side of pan as possible. Brush or gently rub the crust with extra virgin olive oil. Gently spread part or all of the tomato paste on the oiled crust. Sprinkle herb mix over sauce. Layer the remaining items on the pizza in the order listed. While the exact order of the meats and vegetables is not that important, putting the broccoli florets and cherry tomatoes on last right before the fresh mozzarella is important and makes a very pretty pizza. Bake the pizza for 20-30 minutes or until the fresh mozzarella is lightly browned and the crust is browned. Remove the pizza from the oven and allow it to cool long enough for the cheese to set before cutting. Mix ingredients well. Add more flour if needed to form a medium dough. Knead for approximately 10 minutes on a lightly floured surface. Let rise until doubled in size. The mixing, kneading, and raising can be done in a bread machine (or using a sturdy mixer.) Punch down dough. Shape into a smooth ball and let dough rest, covered, for 10 minutes before rolling it out.